Inspiration: Post Impressionist painter Vincent Van Gogh's (1853 - 1890) painting "The Chair and the Pipe' (or Van Gogh's Chair'), 1888-89. My grade 5/6 class are studying the life and work of Vincent Van Gogh at the moment. I have chosen to recreate some of his most famous paintings. For this project, students created a simple box pop-up from two pieces of card. Sorry, I haven't got a photo that demonstrates how to do this but you can see an example and more about pop-ups here. 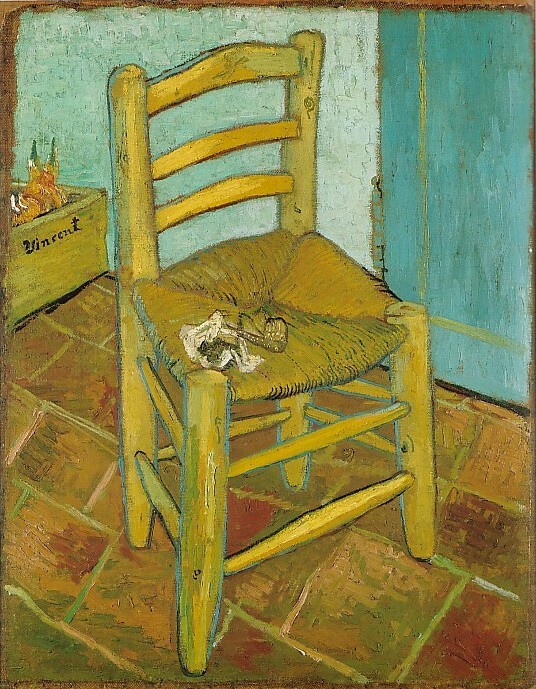 Students then drew Van Gogh's chair onto the card using his painting as a reference and were offered a variety of mediums with which to add colour. Once completed, the pieces of card were glued together and mounted onto a piece of black card. Some are looking more Fauvist than Post-Impressionist with their choice of colour! Oh, and we left out the pipe to make it a little easier (and more politically correct). I love this idea - the popout is brilliant! So creatvie! Have you seen the Tilt=shift images of Van Gogh works at ArtCylopedia, http://www.artcyclopedia.com/hot/tilt-shift-van-gogh-7.htm ? they don't have Van Gogh's bedroom depicted, but they do have a lot of landscapes. These are freaking genius! What a fantastic ideas!!! Thanks for the link Christie, the photos are amazing! I have awarded you a "versatile blogger" award! link up to me and congratulations!!! I love this idea for my last days of school.How didnthey color behind the chair? Thanks sommuch. Do you do any other pop up projects? I've done a thanksgiving table once. Thanks Mrs Ackerman. We made the chairs in two pieces so they could colour the back piece and then glue it in place (if that makes sense?). I have done a few pop-ups for myself but these are the only ones I 've tried with my students. Would love to see your table - sounds impressive! Anne, I had to pin your idea on pinterest, it's so great! Thanks Doris :) Isn't Pinterest just the greatest?! Thanks for the idea. I adapted to a themed chair design. I asked the 5th graders to choose a theme (beach, dogs,etc) and to design a chair that showed that theme. I encouaged them to take the theme to floor and wall. They seem to enjoy this lesson. Displaying them is challenging, but I like how hard my kids are working on them! Thanks Erica - sounds like a great adaptation of my project. Would love to see what your students did when they are done! Thanks a million for this great idea, I've done it this month of impressionism with my 6years old kids, and they loved it. You can see their works http://artecontusmanitas.wordpress.com/2014/03/07/las-sillas-de-van-gogh-en-3d/ they Look wonderful, thanks for sharing! They look perfect – I love the colours they have used!! Please link back to my blog in your post for the original post!